Here we go then, with the first of yesterday's haul of LPs. I use the term LP loosely, as this is anything but long-playing (clocking in at around 20 minutes), but what it lacks in quantity it more than makes up for in quality (how often can you say that nowadays?). This appears to be a second volume of tunes from a single session, although try as I might I can't track down a volume 1. Please let me know if you know anything about the existence of such an LP. The practice of issuing sessions in several volumes seems to have come about due to the limitations in timing imposed by the 10" vinyl format used by Blue Note at that time. This particular copy of the LP is actually a later Japanese 12" reissue. The music is very much in the hard-bop style that was then becoming popular. It was a real surprise to me to discover that Donaldson, later to record such soul-jazz classics as 'Alligator Boogaloo', started out as a dyed-in-the-wool hard bopper. The record kicks off in superb style with a short Blakey solo that acts as a real statement of intent - here is a group that's going to play fast and hard all the way to the end. And that's what they do - all 4 pieces are taken at furious tempos, the energy being maintained throughout. Donaldson is the first to solo in his typical lyrical style, with stabs from the other horns providing an exciting backdrop. The close of 'After You've Gone' is a showcase for Donaldson's alto as the band lay out and let him have his say. The rest of the record remains in a similar style. Special mention must go to the underrated Matthew Gee who cooks up a storm on trombone throughout. 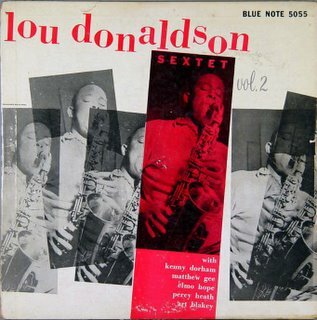 Donaldson never moved far from Blue Note, and there's a useful discography of his work at this site. Currently available CDs by Lou are to be found at his Blue Note page, and of course for an overview of Blue Note in general you could do worse than to check out the wonderful Vintage Vanguard, with sleeve pictures for just about every Blue Note release. The Cellar Door Sessions... Again!